Don't take shots in the dark when you are talking about survival. This One Shot: One Kill, S.O.A. survival bowie is a knife you can always count on. 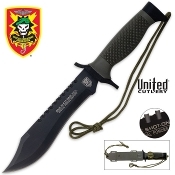 Whether you're deep in combat or simply need a reliable bowie, this one fits the bill.